Birch toilet Paper Roller is spring-loaded. Approximately 5-1/2" long, compresses to 4-3/4" long. Roller body is 7/8" dia. with 3/8" dia. tenons. Potty chairs require a chamber pot and wood toilet paper roller. For boys, order squirt deflector. 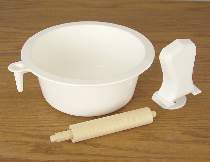 Chamber pot and squirt deflector cup are made from soft, sanitary and easy-to-clean plastic.